The Caretaker Chronicles: Oh Baby, it's cold out! Oh Baby, it's cold out! Greetings one and all. If you're anywhere north of ...well, you don't need to "north" for that matter. Just bundle up. Stay indoors. Stole this from one of the weather type sites. Seems like it's a bit warmer out in the Southwest. Other than that, forget it. We have this little temperature sensing gizmo, that I really like, 'cause it lets you know just how warm or cold it is outside. I don't think I've ever seen it that low. Initially, I wasn't quite sure where to put the thing, and had it out on the front step. Trouble was, the sun would mess with it, and you'd get a false reading. So I had a brief "Wyle-e Coyote, Genius" moment, and it now hangs under the back step. Now, having said that, when the generator does its self test every Sunday at noon, I do think it messes with the sensor just ever so slightly. Just a hunch. In other weather related "news", it so happens that a few of the "high def" channels that we get come out of Chicago, and it would seem that they've had a bit of an issue with their natural gas supply. There was a fire in one of the natural gas compressors, which was quickly dealt with, but then that meant that they're having a heck of a time keeping up with demand. So, the Governor, Gretchen Witmer, had the dubious task of asking everyone to turn down their thermostats. I'm sorry, but when I saw this, I had to chuckle just a bit, and thought, "OK wait, first you're saying you don't know how to manage the infrastructure, and now you're telling everyone that they should take it on the chin??". Hm. Good luck with that. Anyhoo, that's all I got for today. It's a beautiful sunny day, but I wouldn't recommend lying out there in the sun. You'll freeze before you get a tan. Nice to hear from you again and to see you are surviving the deep freeze, Glad we are here in the southwest rather than there. When you thaw out we will come back. Never experienced -20...going to try and keep it that way. Maybe -10 at the top of a mountain while skiing, then it was hot cocoa time and good by skiing that day. Glad you are surviving the Polar Vortex as it has once again been dubbed. Our kids are hating it but the grands get to stay home from school. Bad when they say the Great Lakes are colder then the Antarctic and Mount Everest. For being in the desert we are even feeling the effects down here. I mounted our outside monitor in a inverted wooden box to keep it out of the sunlight and away from any exhausts. Since Beach and I have never lived in such cold weather regions (the lowest we have experienced here in South Carolina is 18F. ), what is your routine for keeping warm in those below zero temperatures? Also, I'm guessing you have to do a big food shop prior to the arrival of polar weather in case you are snowed in or iced in? Inquiring minds want to know! Ha! It's tough to explain if you've never experienced it. If you know of someone who has a restaurant with a walk-in freezer, ask them if they wouldn't mind if you went in for a few minutes. Kinda like that. Goodness, you must have a gigantic heating bill!! 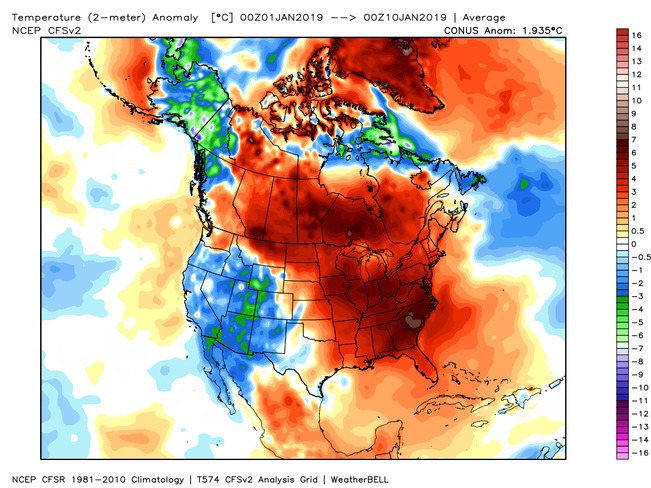 Years ago, when I was a child in the 1950s, the only way my grandparents heated their farmhouse was primarily fireplaces and cooking on the stove in the the kitchen, but that was near the coast of the state of Georgia, never anywhere near the below zero temperatures you are experiencing. Yup, am quite happy to be in that southwest place at the moment. Mo and I were in St Paul Minnesota one January and it wa 37 below, without wind chill, real numbers. I remember I got an ice cream headache standing outside waiting for the bus. ick. Well, here it is 2019.